This is the intro to Spanish Point from the Bela Fleck album, Bluegrass Sessions vol. 2. This kind of solo is very difficult to map out timing wise, since Tony plays it very "open" with a free-style feel. I attempted to place the tabbed notes as close to the recording as I could. Some of the chords are fairly difficult to hear exactly what's being played. I hope my ear is correct. 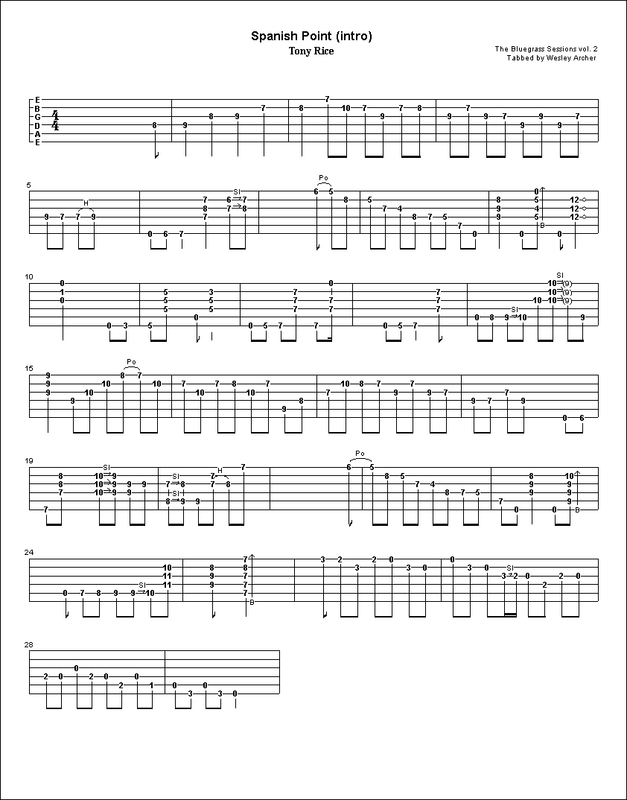 I threw in a MIDI version so you could hear the exact timing of the tab, versus the original. Don't be put off by the seemingly difficult sound of the solo. It's the playing that makes it sound hard. The actual positions are not all that hard. Just keep going over and over it, soon your fingers will naturally gravitate to those positions creating a soothing plethora of notes.